Long Beach’s latest streetdeck—or what have commonly been referred to as parklets—will be in full operation this coming Saturday at Orange and 2nd Street under the auspices of At Last Café. Parklets originated out of take-overs of parking spaces along sidewalks to increase space for pedestrians, often built on pedestal foundations that could quickly be assembled and disassembled (think Park(ing) Day) and are flush with the curb. The overall philosophy is that space belongs properly to humans more than cars. Technically speaking, the French-American bistro’s “streetdeck” is not really a streetdeck or parklet, but part of a bulb-out or an actual extension of the curb. Bulb-outs require not only design but engineering and building elements different than a parklet, where the foundations are essentially temporary. These permanent bulb-outs not only increase pedestrian accessibility but safety as well—and At Last Café simultaneously gets to enjoy the benefit of increased seating. The streetdeck is the work of a public-private partnership between the City and Studio One Eleven (the firm which was the first to implement a parklet in Southern California in 2012 with the opening of Lola’s streetdeck in the heart of Retro Row), with various other groups involved as well, such as JR Van Dijs Builders and Developers (the guys behind the current restoration of the Psychic Temple Building at Broadway and Long Beach Boulevard). 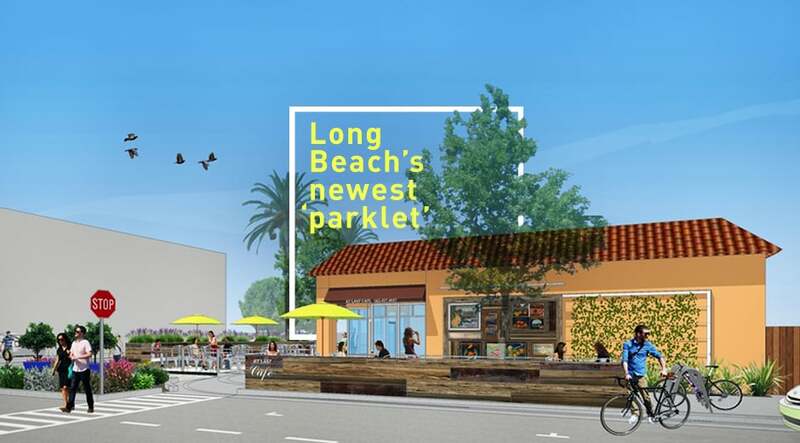 The Long Beach Parklet program was created and has since flourished, with streetdecks at Berlin in the East Village, Number Nine and the aforementioned Lola’s on Retro Row, and now At Last Café in Alamitos Beach. The move marks a growing believe in “tactical urbanism”—a term often used by Principal and Director of Design at Studio One Eleven Michael Bohn—which is essentially urban design that is cost-effective and quick without losing aesthetic quality or utility. At Last’s streetdeck is the larger yet: while the others increased seats by about 22, the newest addition to Long Beach’s sidewalk real estate will offer 40 additional seats (much needed for the bistro since this will mark not its second but THIRD expansion). If all goes as planned, owner Owner John McLaughlin is confident the streetdeck will increase business; after all, Kerstin Kansteiner of Berlin and Luis Navarro of Lola’s have claimed an increase in business of 30% since opening up. The streetdeck will have its official opening this Saturday, March 29, at 11AM at At Last Café, located at 204 Orange Avenue.